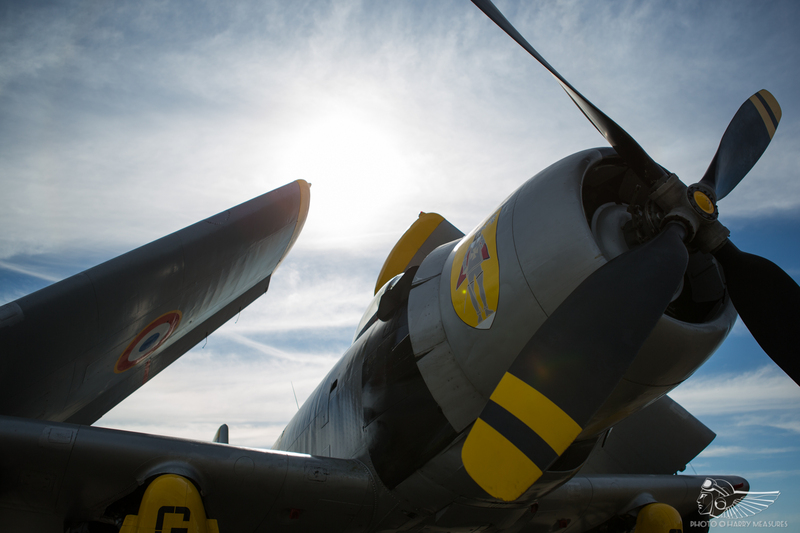 It was with great anticipation that enthusiasts watched the inaugural Paris-Villaroche Air Legend airshow burgeon over summer 2018. 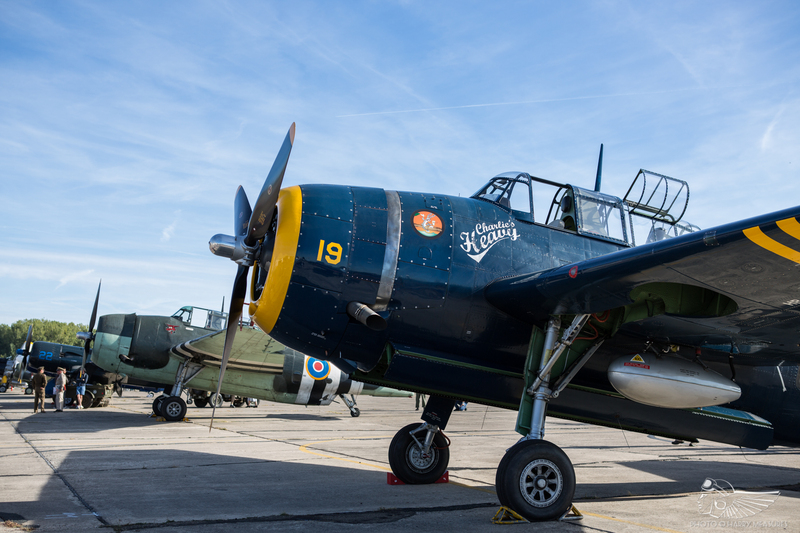 An initial participation list published in the spring looked solid; word at La Ferté-Alais in May was that Air Legend, held at the historic aerodrome at Melun, was one to watch. 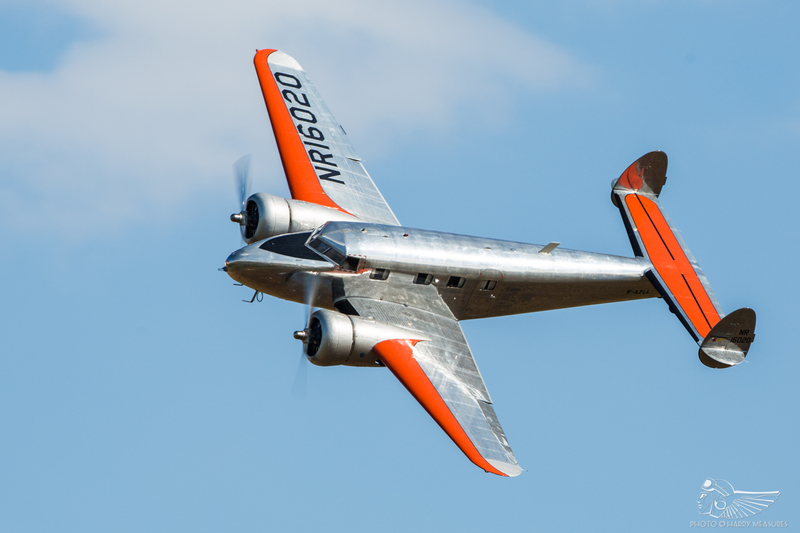 That mantra rang true with the expansion of the participants list to include dozens of warbirds and vintage aircraft, supplemented by a healthy number of classic jets and modern military assets. Clearly, this was one not to be missed – albeit some uncertainty lingered at the back of the mind. 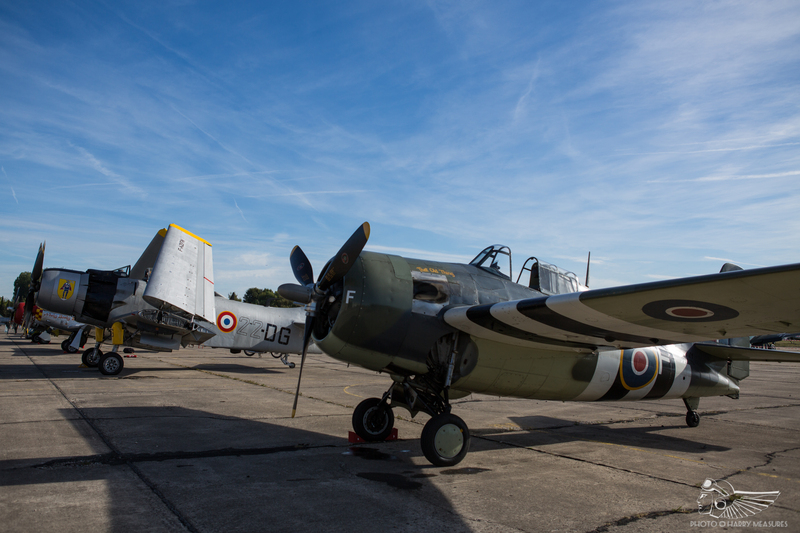 This was the first Melun airshow in a decade, run by a different organisational team, with a particularly ambitious line-up – one had to wonder whether Air Legend could live up to the lofty expectations placed upon it. Aérodrome de Melun Villaroche is situated in the Île-de-France region of northern France, around 20 miles southeast of Paris. The aerodrome was occupied by German forces from June 1940, becoming a busy Luftwaffe base for several units operating Junkers Ju 88s and Heinkel He 111s. It was liberated by Allied forces in September 1944, after which American units moved in. Melun was designated A-55, a USAAF Ninth Air Force airstrip, and was home to C-47 Skytrains, A-20 Havocs and A-26 Invaders. 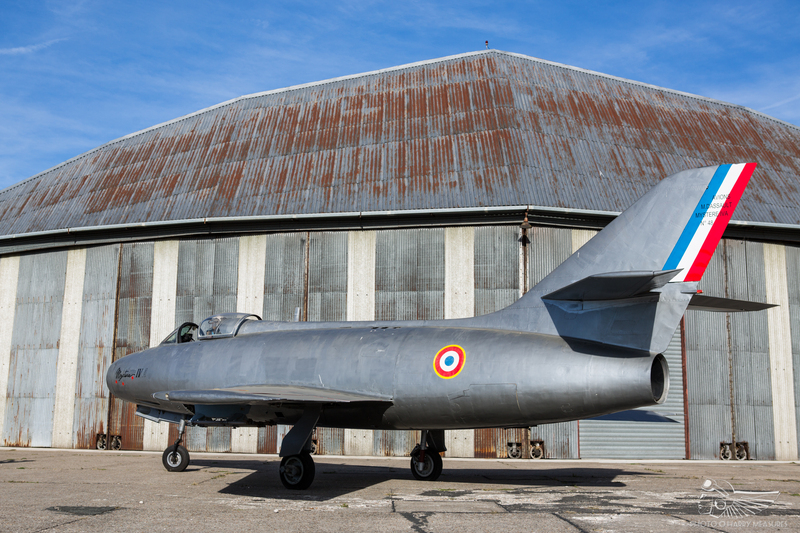 Postwar, the aerodrome passed back to French control and was utilised for prototype air testing by Dassault and SNECMA, including for experimental VTOL designs. Reminders of its past can be found across the site, not least in the atmospheric hangars that dominate the western side of the aerodrome. It’s quite something to think that spectators were walking across the same apron used by Ju 88s, A-20s and Mirages over the course of several decades – much of the site has been revamped and overhauled in the intervening years, but the ghosts live on. Organisationally, the off-site parking worked well – well-managed queues, a very short walk from car park to aerodrome and smooth running ticket booth queues made getting in uneventful. Melun’s layout is a little unusual for an airshow; an enormous dilapidated hangar towers over the main aircraft ramp, with a combination of modern and historic clamshell hangars either side. The ramp was utilised as the main aircraft park for the airshow, with lines of aircraft parked into the crowd and accessible through a €5 ‘flight line walk’ for a few hours each morning, sans barriers on Saturday. Disappointingly that main hangar remained closed to visitors, albeit its doors were partially opened to allow visitors to get a glimpse of the rarities inside – some incredible aeroplanes, including Ilyushin Il-10, Skyraider, T-28 Fennec, B-25 Mitchell, Junkers Ju 52, Bolingbroke Mk.IV, an Ethiopian Fairey Firefly and a raft of interesting wrecks and relics. Notable too was the SPAD from Compiégne, assembled at the front of the hangar. From speaking to some of the staff, it seems there were too few volunteers available to allow spectators free access to the hangar; perhaps a ticketed tour system could be considered at future shows whereby small groups could buy tickets in advance to join a volunteer for a bespoke look around the facility? 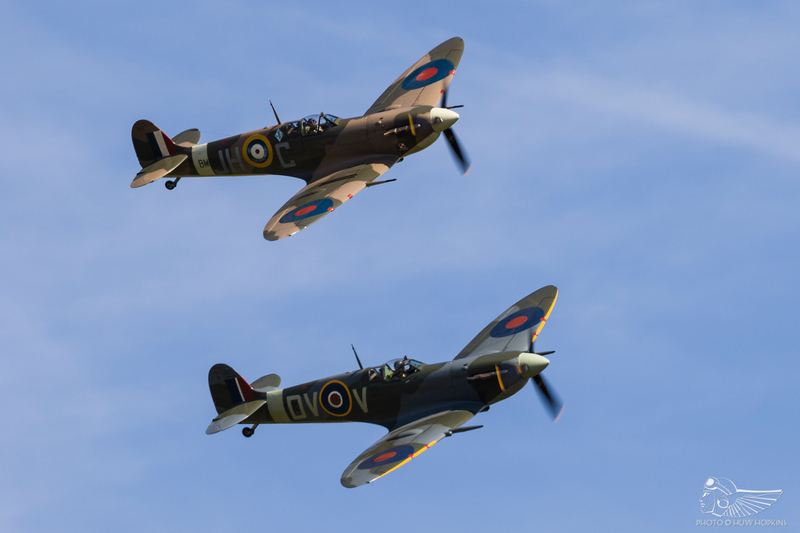 There are certainly practicalities to consider, but the word was that the museum owners were keen to raise its profile – how better to do so than by allowing limited numbers to view the exhibits at September’s big airshow? The ‘Patrouille Ham and Jam’ Piper L4 Cub duo began the vintage element of the flying display, whilst other lighter acts – a fantastic Fieseler Storch and Piper Cub mock dogfight, and the energetically executed tail chase of Bücker Bü 131 Jungmann, Boeing Stearman and Vultee BT-13A Valiant – offered a welcome interlude later in the programme. 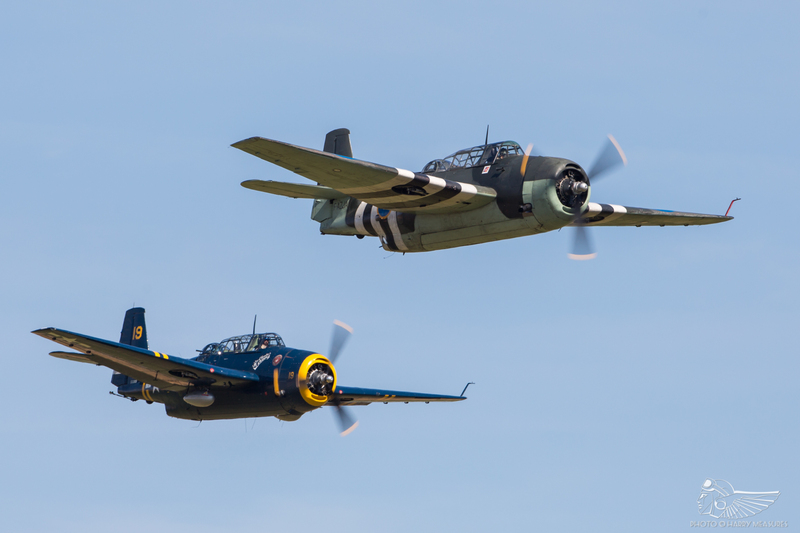 Air Legend 2018 was, however, predominantly a warbird show. 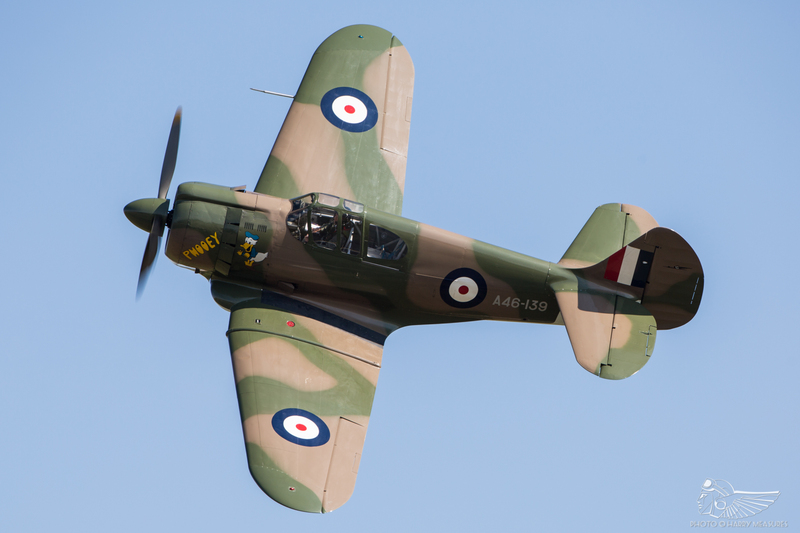 It had been a long time since we’d seen quite so many British warbirds deployed to an airshow on the continent, and here several of the major UK operators were in attendance. 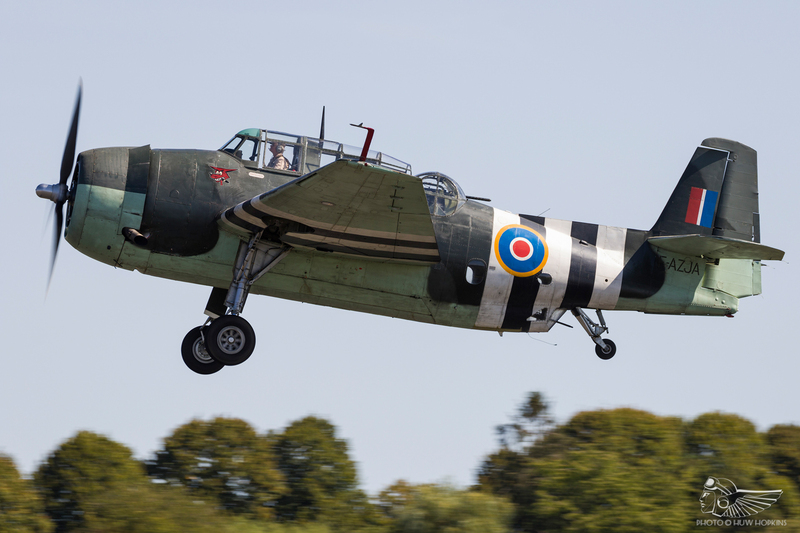 Warbirds owned and operated by Air Leasing, Anglia Aircraft Restorations, The Fighter Collection, the Historic Aircraft Collection and Will Greenwood all made the cross-Channel trip to join others from France, Belgium, Switzerland and the Netherlands. 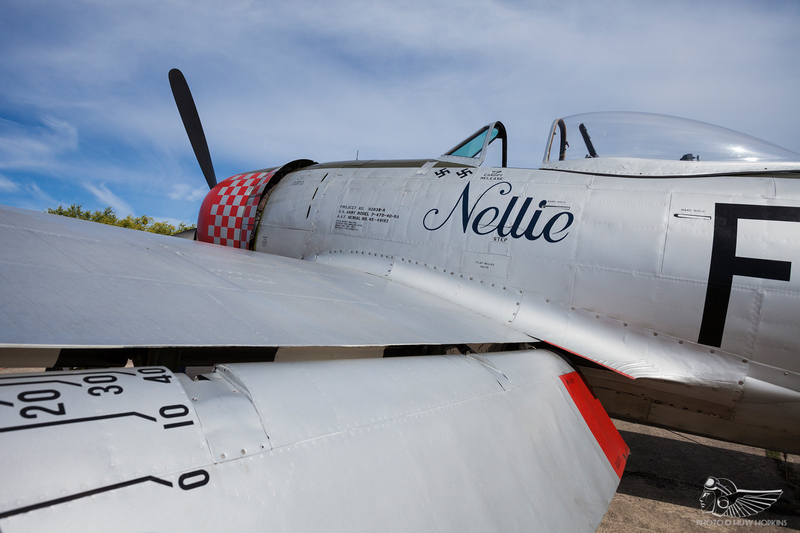 It was a truly multinational affair and wandering the aircraft park each morning surrounded by 22 single-engine Second World War warbirds and dozens of transports, liaisons and classic jets, Air Legend just felt big. The flying display itself was a bit of a mixed bag. Of the solo displays scattered throughout the programme, P-47D Thunderbolt Nellie (flown beautifully by Pete Kynsey) and the La Ferté-based Les Casques de Cuir Corsair (piloted by Edmund Salis) stood out, whilst the routines of French airshow regulars P-51D Mustang Nooky Booky IV, P-40 Kittyhawk, Sea Fury FB11, Lockheed Electra and OV-10 Bronco were all most enjoyable and fit in well around the more choreographed set-pieces. Saturday’s first-time formation of Morane-Saulnier MS.406 and two Hispano Buchóns – White 9 and Yellow 7 from the Sywell-based Anglia Aircraft Restorations and Air Leasing collections respectively – was a joy to see, but meant that the Buchóns (flown by Richard Grace and Dave Puleston) were left with a very short slot that limited them to only three passes. 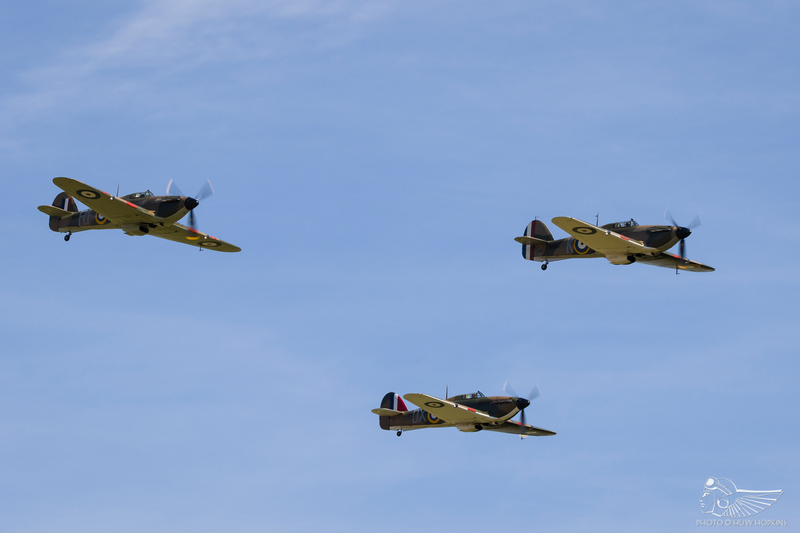 The subsequent Hawker Hurricane trio – believed to be a first for a French airshow – fielded Mk.I P2902 (Anglia Aircraft Restorations), Mk.I P3351 (Jan Roozen) and Mk.XII P3700 (Historic Aircraft Collection) and was a considerably longer sequence, with a formation pass leading into a tail chase led by Dave Harvey in P3700 with Alex Smee in P2902 whilst Bruno Ducreux displayed P3351 overhead. This had the feel of a multi-layered Duxford style set-piece, and worked very well. 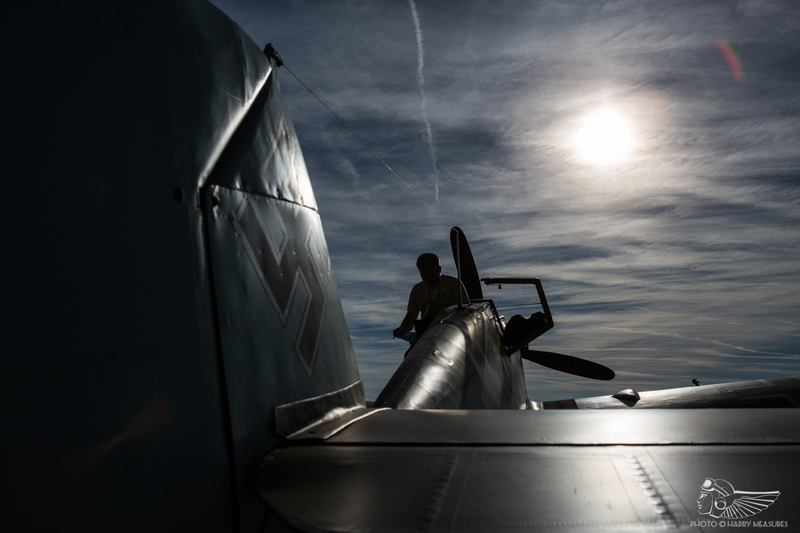 Adjustments were made on Sunday and accordingly Daniel Koblet flew a tidy solo in the Morane before the Buchóns strafed the airfield, drawing the ire of the Hurricane trio. The Luftwaffe and RAF fighters then joined for a mock dogfight, the British operated machines tail chasing in pairs and interspersing their passes. This was an excellently choreographed sequence that gave us a lot more Buchón flying than Saturday had. 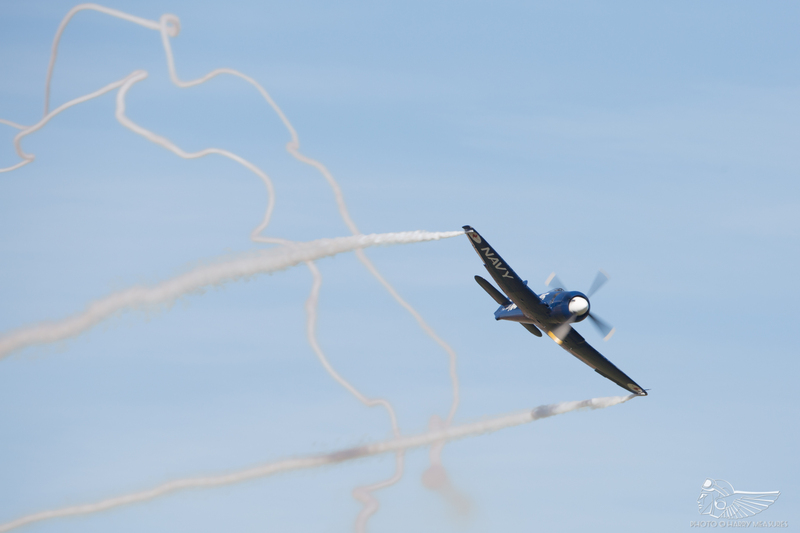 Bruno Ducreux’s elegant solo in Hurricane P3351 concluded the display as the other fighters landed. 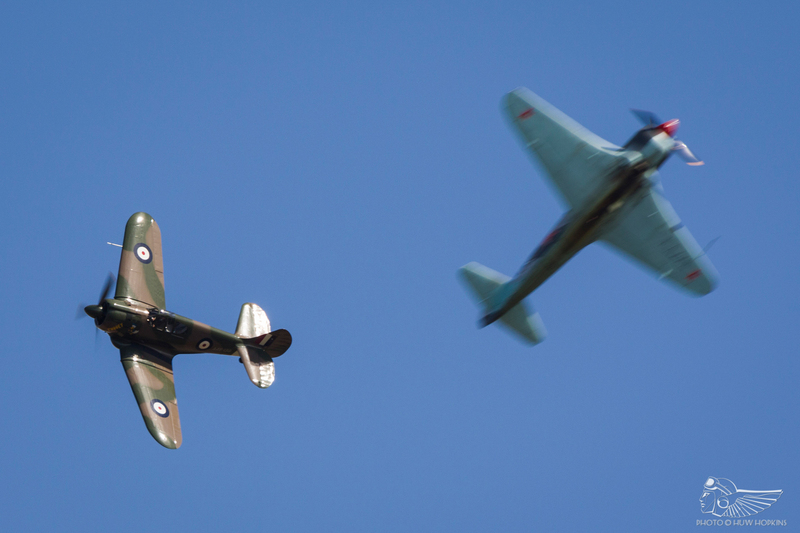 Anglia Aircraft Restorations and the Historic Aircraft Collection’s Spitfire Mk.Vs EE602 and BM597 were then led through a lyrical aerobatic display by Jon Gowdy, with Charlie Brown close behind. Seeing the French crowd’s reaction to the Hurricanes and Spitfires was a timely reminder that UK enthusiasts so often take their like for granted – here, they were received with a touching reverence so often lacking at British airshows. The mock dogfight pitting Remko Sijben’s CAC Boomerang CA-13 replica against Rick van der Graaf’s R-2000 powered Yak-3 was genuinely exciting, the two aircraft tangling in a tight-turning, aggressive low-level scrap – a far cry from the more gentle tail chasing most ‘dogfights’ involve. 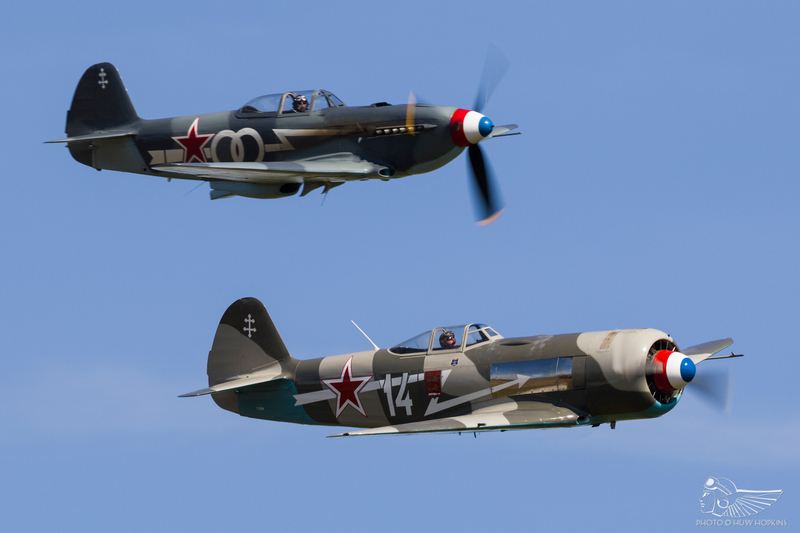 Local pilot Robert Villanova led a multinational Russian Front sequence in the based radial Yak-11, with Will Greenwood in his beautifully turned out Yak-3 G-OLEG and Emiliano Del Buono in 46 Aviation’s Yak-9 alongside for a series of passes. 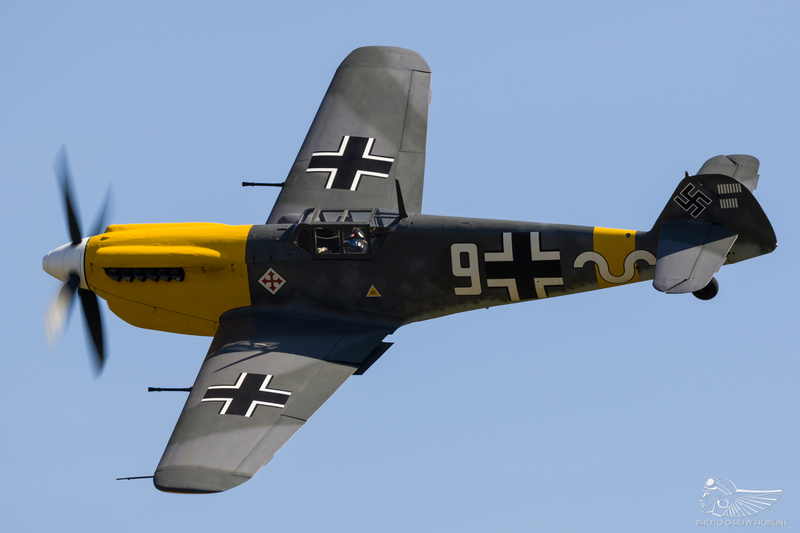 Opportunities to see multiple Yak fighters flying together are now few and far between and gathering four examples at the same venue was something of a coup, albeit a slightly lengthier slot would have been welcomed. 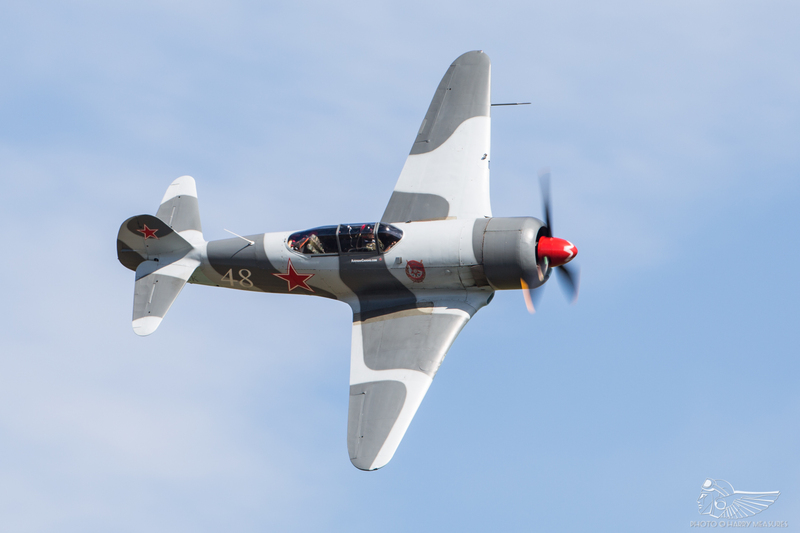 Villanova’s thunderous low, close and lyrical solo display in the Yak-11 was one of the weekend’s high points. It had been hoped that Frédéric Akary’s F-86 Sabre would have crossed the Atlantic Ocean in time to make its European debut at Melun; though that was not to be, the drafting of a suitable last minute replacement more than made up for the disappointment. 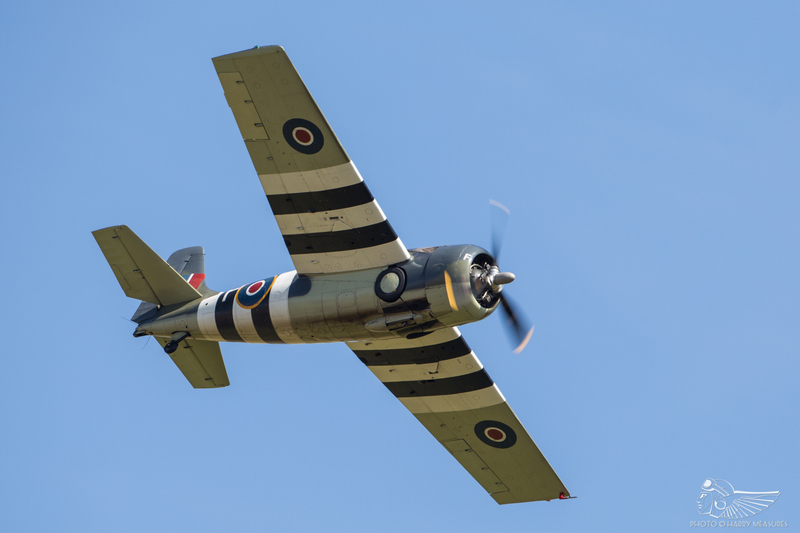 Accordingly, the based AMPAA Grumman Avenger (a D-Day striped, camouflaged machine seldom seen at airshows) was joined at the eleventh hour by Charlie’s Heavy Association’s Avenger from Switzerland, the first time both of the continent’s TBMs had flown together, to the best of my knowledge, since Flying Legends 1998. 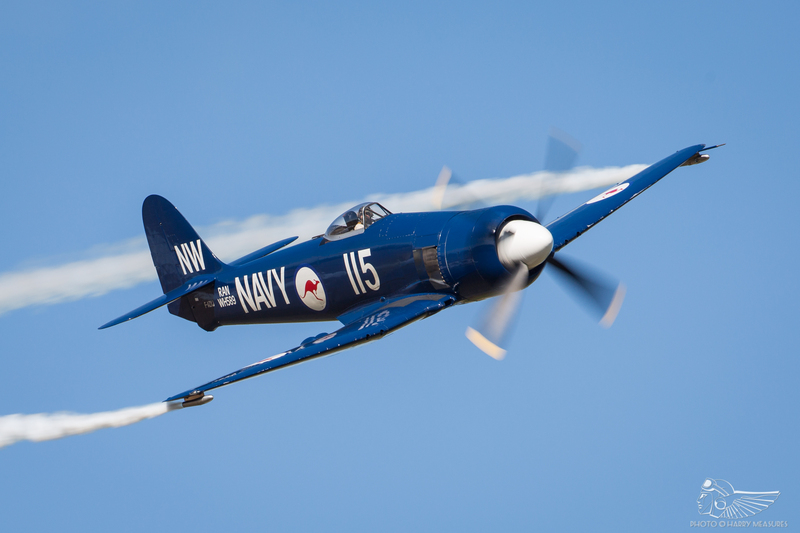 Andy Durston kicked off the naval display slot with a solo in The Fighter Collection’s Grumman Wildcat, flying a well put together sequence of aerobatics. The Avenger pair were unable to get together for a close formation pass on Saturday (though the Wildcat joined them for a loose run through), but Sunday saw them tighten up for a couple of flypasts before breaking into their tail chase, intercepted by a modified T-6 masquerading as a ‘Zero’ for a low-key, somewhat redundant ‘dogfight’ that added little to what was already a significant occasion. La Ferté-Alais has made the Tora! Tora! Tora! set-piece its own over the course of more than two decades, and typically fields up to a dozen T-6 Texans for the sweeping airfield attack. Melun’s Tora-lite simply didn’t have anything approaching the same impact; four Texans circled high over France’s Flying Warbirds’ PBY Catalina (a rare solo appearance from that machine) and carried out the traditional peel attack with flak and pyrotechnic effects, but the excitement elicited by the ‘full fat’ LFA equivalent just wasn’t there and it felt rather rote. That said, the Vietnam and transport sequences – both La Ferté staples – worked well here despite feeling a little too familiar. The former saw France’s Flying Warbirds’ Douglas Skyraider (accompanied by the OV-10 Bronco on Sunday) carrying out a roaring low-level attack run with napalm pyrotechnics before putting on a fantastic solo aerobatic display. 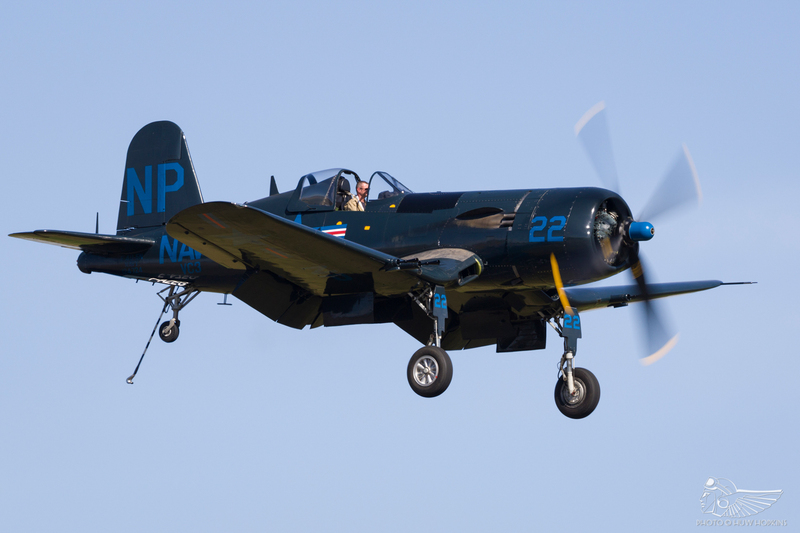 Some of the figures flown by Bernard Vuipillot truly belied the Skyraider’s immense size – a climbing vertical roll into a reverse cuban and a ‘rolling circle’ (a figure normally reserved for pure civilian aerobatic types) were particularly impressive. The transport quartet was also a highlight. 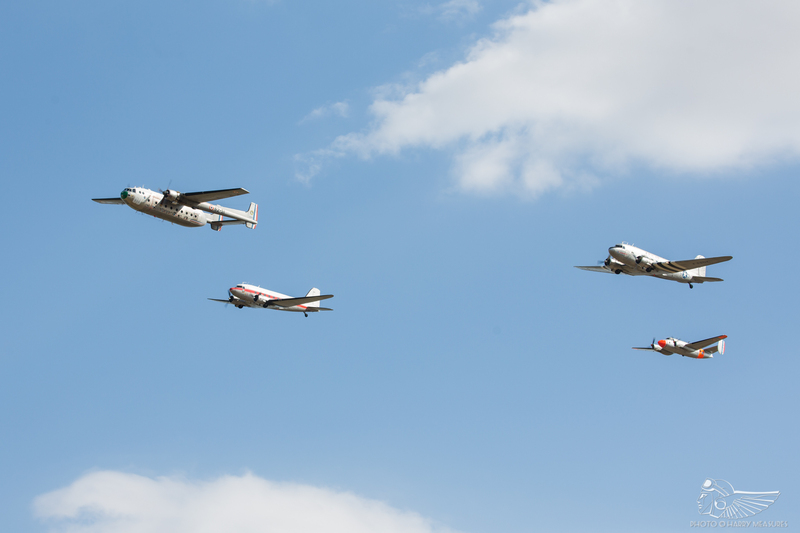 Led by the Nord Noratlas (a French classic operated by L’Association Le Noratlas de Provence and seen all too rarely, even in its home country) with two DC-3 Dakotas flanking it and a Dassault Flamant tucked into the box, the formation passes and spirited on-crowd break will live long in the memory. The solos from the based Dakota (a combat veteran C-47) and Flamant were both fine accounts of the types, whilst the Noratlas’ fairly brief display offered some of the weekend’s most enduring memories, not least the natty Khe Sanh approach to land on the closer cross runway. 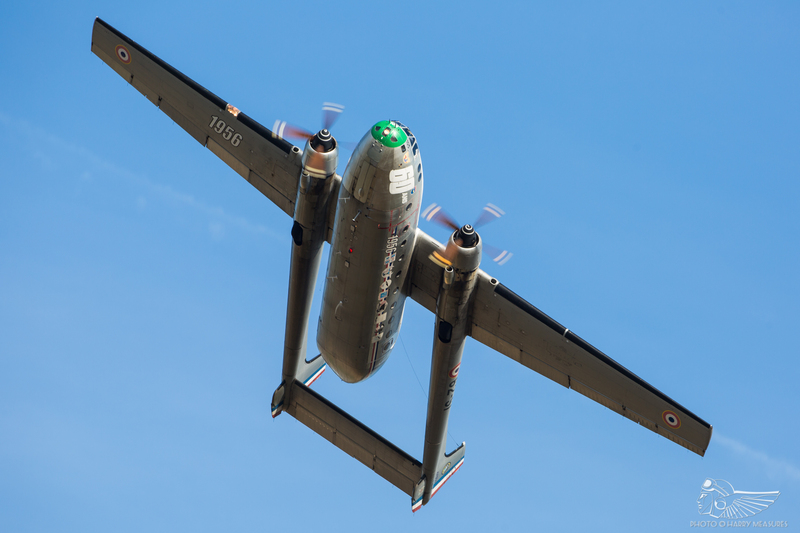 The Noratlas was perhaps the solo highlight of Air Legend 2018, its boxy fuselage, twin boom tail and SNECMA-built Bristol Hercules radial engines giving it great presence as an airshow act. The show’s conclusion was left to the present day French armed forces. 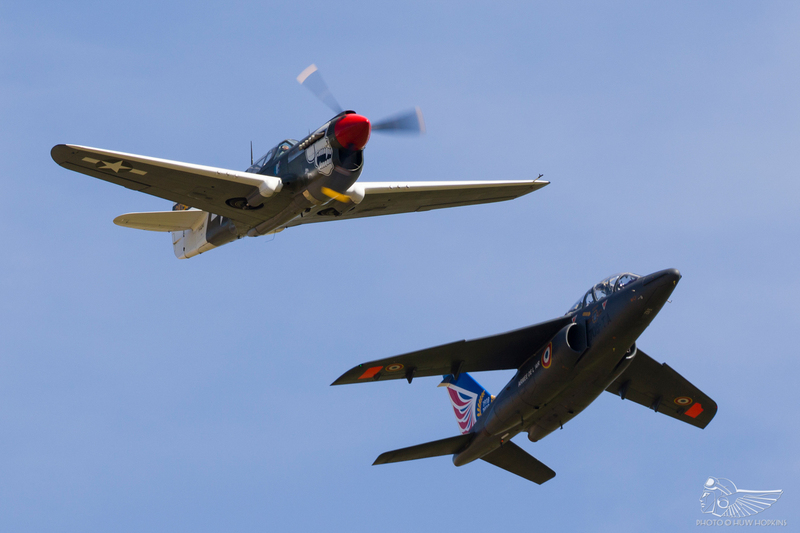 First up, the Aéronavale and another ode to La Ferté-Alais – here, the Morane-Saulnier MS.760 Paris led a pair of French de Havilland Vampires and a quartet of Dassault Rafale Ms for a formation pass before the jets split into their respective routines. The Vampires were, sorry to say, largely wasted with just two high and straight passes on Saturday; a third, topside pass on Sunday went some way towards salvaging their display, but it was disappointing not to see more of them, particularly given that one of the pair had performed an excellent aerobatic solo at La Ferté-Alais in recent years. 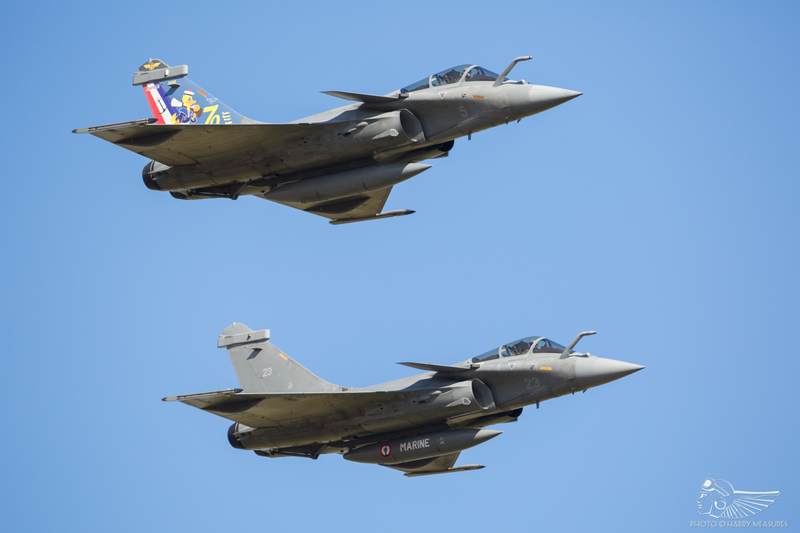 The Rafales’ sequence here was a tad shorter than that seen at the La Ferté Meeting Aérien in May, and at RNAS Yeovilton in July, but was punchy and entertaining nonetheless with a fast-paced mixture of high-speed opposition runs, slow-speed formation passes in different configurations and aggressive tail chasing and breaks. 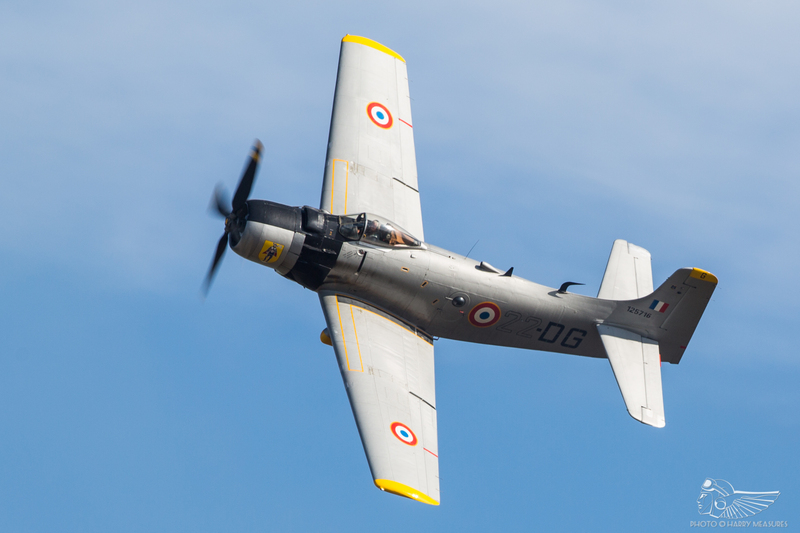 The Armée de l’Air bookmarked the programme, beginning with the solo Alpha Jet E flying with the P-40 Kittyhawk in a tribute to the late Constantin Rozanoff, a pioneering Russian-born French test pilot for Dassault. 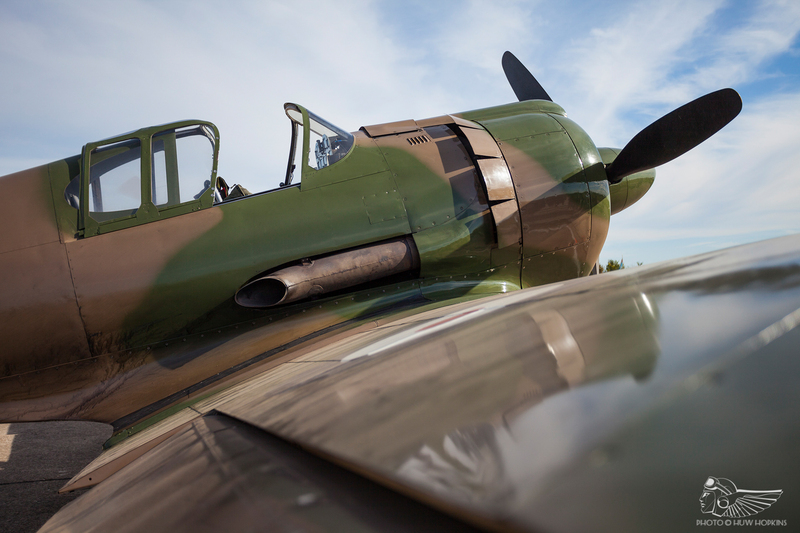 Rozanoff’s story is a remarkable one – he initially test flew the likes of the Morane-Saulnier MS.406 and other French classics before piloting the Curtiss Hawk 75 during the Battle of France. 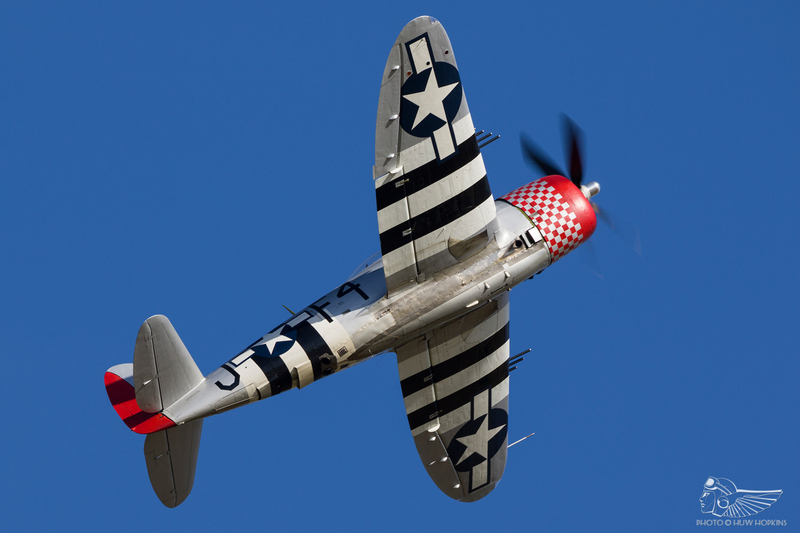 His military service saw him deployed to Tunisia and Algeria, flying the P-40 in the Mediterranean theatre. Rozanoff went on to further his test flying career in the UK and USA; postwar he became the first French pilot to break the sound barrier in level flight. He was sadly killed in a Mystére IV during a flight over Melun – his extraordinary exploits were honoured with a ‘missing man’ formation flown by the Alpha Jet and Kittyhawk, the former pitching up and out of formation at crowd centre. The Alpha Jet went on to fly an incredibly high quality display that put many afterburning jet demos to shame. At the opposite end of the flying programme, Saturday’s finale saw the Patrouille de France perform elegantly in the low evening sun – the PdF absolutely deserve all the credit they receive and their flawless demo at Air Legend further emphasised their standing as one of the world’s very best national display teams. 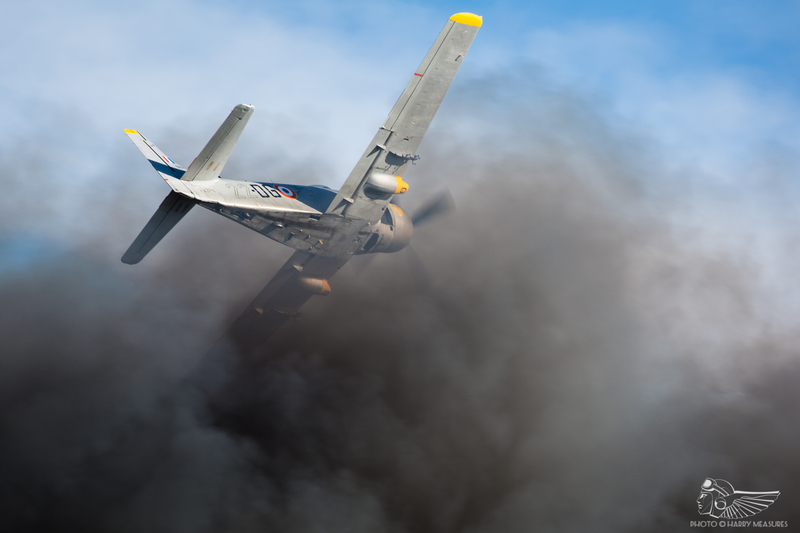 As with any inaugural airshow, there are plenty of talking points to chew over after the event. The use of all four runways didn’t always work – though the departures and recoveries on the shorter runway 01/19 kept the action close and impactful (particularly so when seeing the likes of the Noratlas and C-47 operating from it), the intermittent use of the longer runway 10/28 meant many take-offs and landings happened out of sight of the crowd, giving the impression of gaps in the proceedings and an occasional detached feeling. The display line itself was excellent and though there were some inconsistencies in distance between acts, that’s to be expected and in general, the warbird and jet flying in particular was considerably closer than the vast majority of UK venues. As the sun moved behind the crowd mid-afternoon, the displays were lit beautifully and some fantastic photographic opportunities could be had. 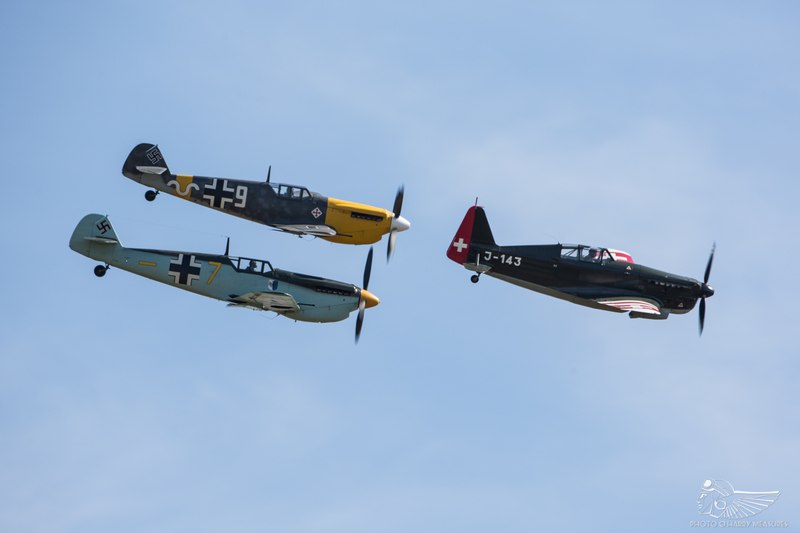 The La Ferté-Alais similarities were a little jarring, with the two sharing both a broadly chronological flying programme and five set-pieces (the Tora! airfield attack, Yak trio, transport formation, Vietnam sequence and Aéronavale jets all being longstanding marquee acts at LFA presented in ‘lite’ format here).  The net result was that Air Legend struggled to find its own identity. Suffice to say it’s unfair to expect an airshow to do this in its first year, but the number of similarities with France’s other major historic aircraft show may have hindered it in this respect. It’s a difficult one to judge – when the overall quality is so good, does it matter that it has adopted some of the La Ferté staples? 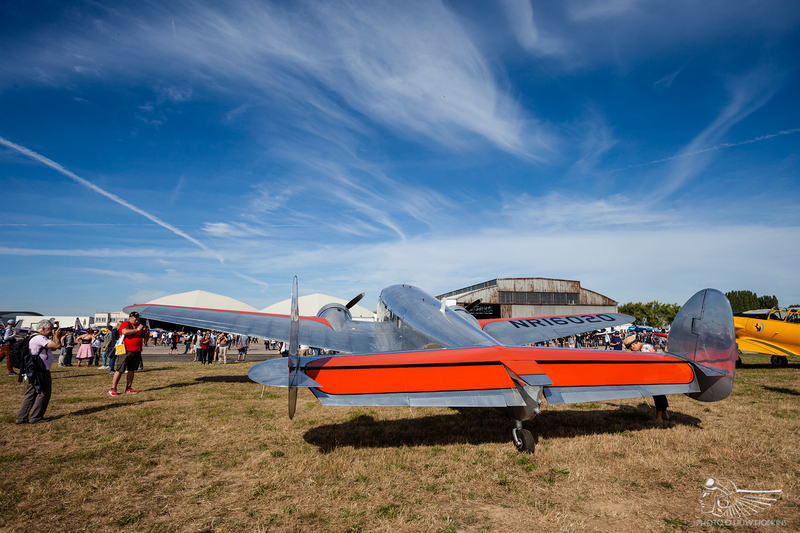 Flawed, yes, but with a genuinely fantastic, imaginative line-up, atmospheric venue and perfect weather to boot, Air Legend 2018 was a tremendous inaugural show, one of the year’s best events with plenty to chew over. 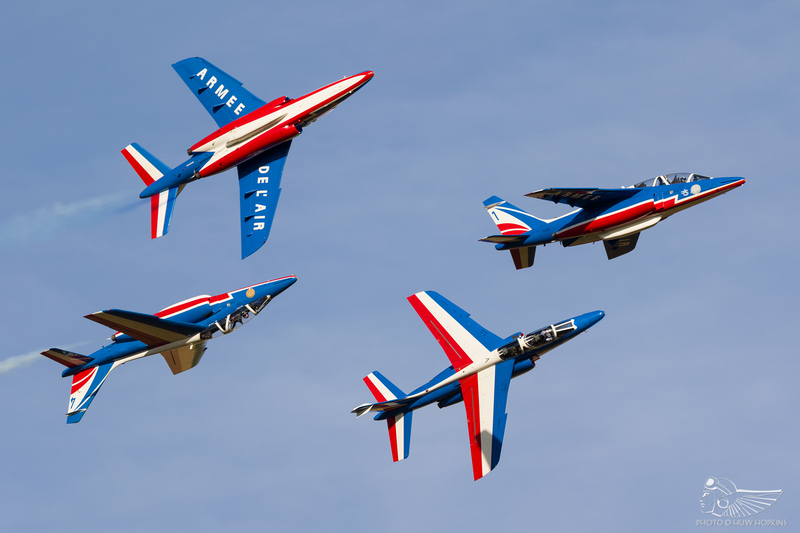 No doubt the organisers, J-M Airshow’s Eric Janssonne and Thierry Marchand, will continue to fine tune the event in years to come – given it was the first event at Melun for a decade, and the first under this new organisational team, the fact that not everything worked should come as no surprise. 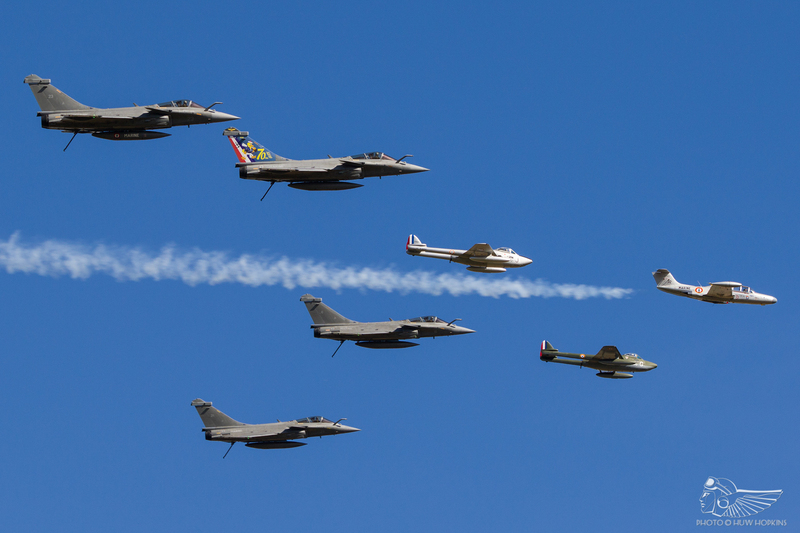 My gut feeling on leaving Melun was that J-M Airshow have all the ingredients to solidify Air Legend’s standing as one of Europe’s best airshows. That they bolted out of the gate with such a strong first offering, and that the reception has been so overwhelmingly positive, is encouraging. The next Air Legend is scheduled for 7-8 September 2019 and promises a Cold War theme with postwar pistons and classic jets being the flavour of the day. The potential is incredible, Melun’s future ripe with possibilities – I’m truly excited to see where Air Legend goes next.